If you haven’t already grabbed a few noodles in the clearance section, you may want to do that now. Wreaths and images courtesy of SheKnows DIY (Santa theme) and Candice Craves. If you’ve sent your clothes to the dry cleaners, you’re likely to have a few of these in your closet. If a single hanger wire is too small for your project, check out hardware stores for the same wire on spools. 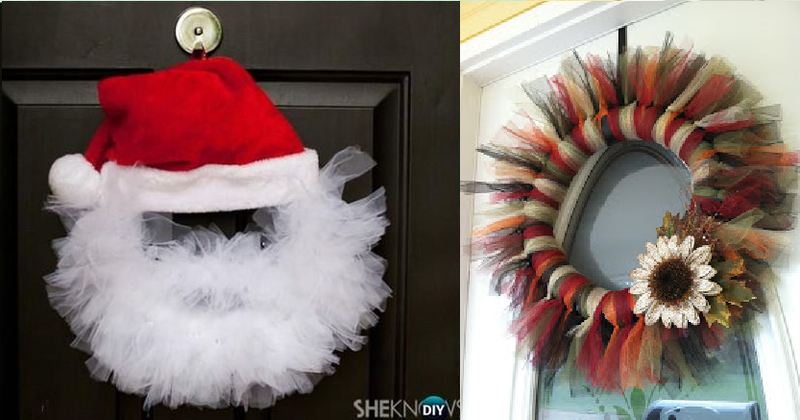 This is probably by far the most inexpensive way to make a wreath, but the results are awesome. Images courtesy of Amy Davidson on Pinterest, and Southern Girl. Have a laundry basket that has seen better days? Reuse it to make a wreath. 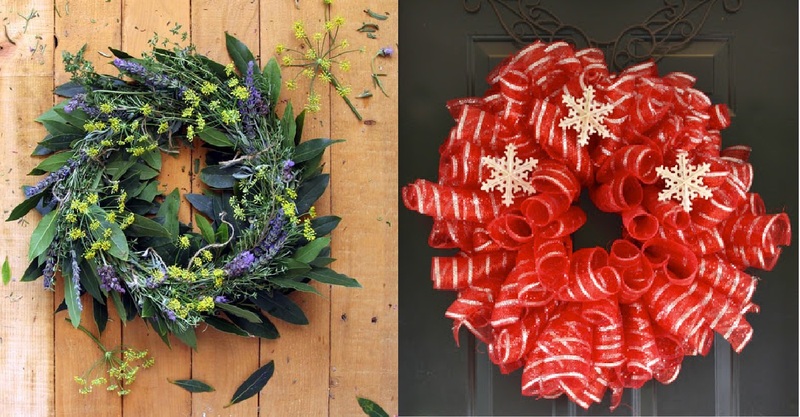 You can find the greenery wreath tutorial at Home Talk and the red mesh holiday one at Architecture of a Mom. The Bold Abode, Savor and Savvy, and Accidentally Wonderful have good tips for dyeing or painting filters. Wreath images courtesy of Momma and Baby Love, and Savaged Whimsy. If you stock up on holiday cupcake liners after the end of each season, you’ll have enough to bake and make a wreath or two. Image courtesy of Courtney Sanchez. Recycling at it’s best, cardboard can be found in every home. Cereal/ shoe/boot boxes, TV/Appliance boxes, etc. The local liquor store is also a great source for free cardboard. Images courtesy of Pegs Gotta Do and Cool 2 Craft – both have great tutorials. Everyone has had a sock lost in the laundry, or found a hole in one. Don’t throw them away! 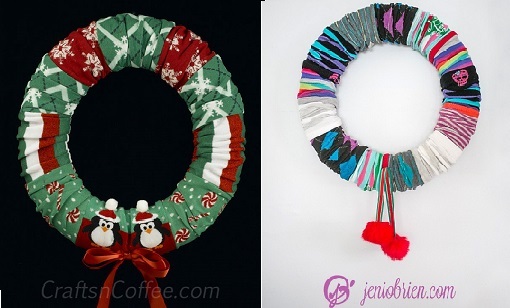 Crafts N Coffee and Jeniobrien.com gives us great example of their reuse. Especially with the holidays, many of us have a bag full of aluminum cans waited to be recycled. Images courtesy of Crafts n Coffee and techefficacy via Reddit. After seeing all the possibilities, it’s hard not to be inspired. 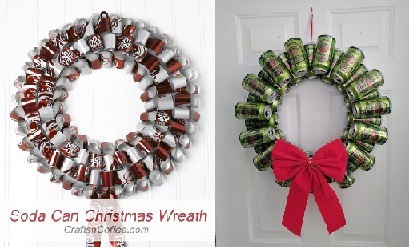 If you would like to share your own unusual wreath, please feel free to send me a pic or link to your site. Thanks for checking in and have a great Thanksgiving. This entry was posted in DIY, Seasonal Decorating and tagged Cardboard, Christmas, coffee filter, cupcake, DIY, Frugal, Hanger, How-to, Inexpensive, Laundry Basket, Liner, Paper, Plastic, pool noodle, shelf, sock, Wreath by thewritegirlforthejob. Bookmark the permalink.